be inspired and have a go at our latest challenge. I was always the last to leave because I had the biggest mess to clean up. and so this collage was born! Cathy left a comment on one of my posts (hi Cathy), and I went blog hopping from her site and ended up somewhere that explained what a collage was…layering, bits and pieces and different textures all brought together with a common link. My link here is the thread! Using buttons, ribbon, thread and lace to bring all the elements together my collage is complete. I have used alcohol inks. The tape measure effect is a tape measure stamp stamped onto tissue paper, ripped and then glued onto the alcohol inked card…and while I was at it, I added some gilding flakes with the glue as well. I added more alcohol ink afterward to hide any tissue that was showing. This is done from the same inked background card and overstamped with a stamp from my Oxford Impressions ~ dress-forms and corsetry set. I then cut it into squares and switched them all around and stuck onto black card to form the background. I ripped the bottom and dipped it in gold embossing powder to add richness. Is stamped in watermark on black card and embossed with gold embossing powder. This is the cool part, I then got my embossing “pen” and added some strokes to the image and embossed again with red powder…I think this has added heaps of depth and more interest to the corset…and finally some rhinestones for bling. I adhered this to a dress-form that I stamped onto acetate and I have raised this above the mosaic. Then it is all brought together with lace,ribbon, threads, hessian, buttons and a tag. (a little complicated ~ but..) Enjoy! Very cool card! Love all the different techniques you used and the results! Beautiful! What a fabulous vintage card, love the corset image. Thanks for joining us at The Ribbon Reel this week! What a fabulous card! Great idea to add the extra detail with heat embossing too! This is such a clever piece Dot and does not give the feel of being disorganised at all. You have created a wonderful collage of elements that all fit together beautifully with a fabulous design and gorgeous colours that make a stunning card. I love it. Love your collage and the story you shared with us. The colours and details are fabulous. Fabulous project, Dot! The colours are just beautiful. 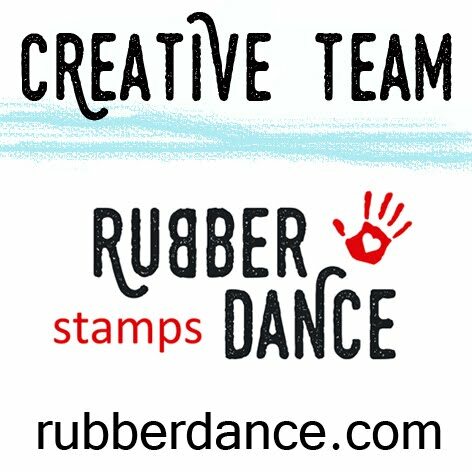 Thank you for joining our challenge at Crafty Cardmakers. This is gorgeous sweetie. Thank you for joining us at CYDA this week and good luck. Dot, talk about one gorgeous card! The alcohol background is just awesome and I love that beautiful mosaic and all the textures you incorporated! Have a great Sunday! Your card is beautiful. I've always been in love with vintage dress forms. There's something so romantic about them! I can tell that you put a lot of thought and effort into making this card. Wow, that corset alone is to die for! The lace is gorgeous. But you're right. The best part is the corset. Love, love, love it!!!! Thanks for joining us this week at Glitter Geeks. Dot, such an outstanding piece, love the colors and all the elements. Thanks for the detailed steps. I just love this Dot! You always get such dimension and lovely rich colouring on your creations and it's lovely to see how it all came about. Beautiful work which makes a lovely card. The embossing on the corset is a nice touch. Thanx for joining us at Crafty Cardmakers this week. Stunning card Dot. 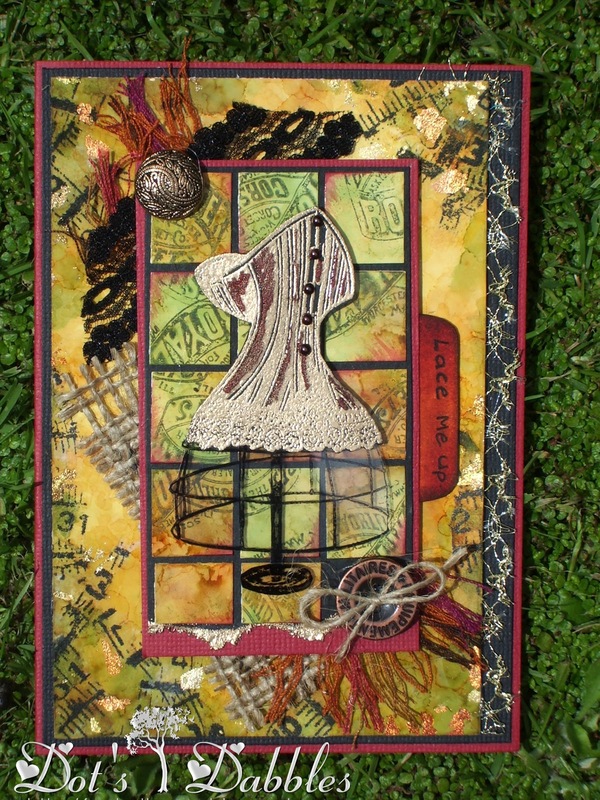 Great corset image and a fabulous background, loved reading how you made it. Oh Dot, this is gorgeous, my friend! And I adore the corset–I think they're so dreamy!! !